I have fallen in love with using Prezi with the Interactive White Board (IWB) when working with students in early elementary. I thought I’d share a few of my ideas and see if I could get your help to generate a few more. Students love to watch the movement of the Prezi and they can’t wait to turn the digital pages by taking turns clicking the next button. Because the text and pictures are so big, it’s the ultimate “big book”. Every student can see every word and every illustration or image on every page. Prezi stories allow for unique possibilities too. I wrote a story for the kids called “Jerome’s Dirty Floors”. It’s about a mechanical engineer named Jerome who wants to create a robot to clean his floors since he doesn’t have any time. He looks for inspiration in objects all around him. He imagines a robot vacuum that is remote control operated like his son’s toy. He imagines one that runs on tracks like the train on which he commutes. Eventually he observes the bumper cars at a park and decides they are the perfect inspiration for a robot vacuum. The story ends there, but the Prezi continues. The next screen has a few questions to check for comprehension. We discuss and share answers. Then, a question for fun, “Do you think a robot vacuum cleaner could really exist?” Consistently, students mostly vote “no” with their down-turned thumbs. 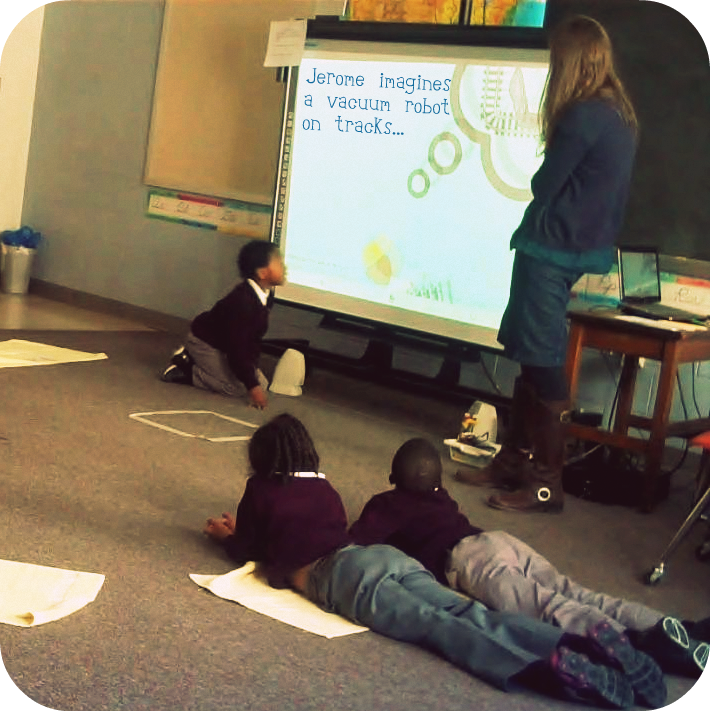 You can imagine the smiles and “oohs” and “ahs” when we hit next on the Prezi and an iRobot Roomba video starts to play. 2. Prezi for watching YouTube videos. Prezi is a great way to share YouTube videos with young students. Once the video is embedded in the Prezi, there is no side screen chatter, advertising, or user content to distract them. It completely removes the potential for anything inappropriate or unexpected to pop up on the screen. 3. Prezi for simple assessments. A fun way to review a concept or check for comprehension is to create a simple assessment in Prezi. Insert a question, then have the students use thumbs up or down to vote, or do a quick pair-share. Then, let a student push the next arrow to zoom across the screen and check if their responses are correct. We played each video and observed the object in motion. Then students voted yes or no with thumbs. Then, we clicked the next button to reveal the answer. After the first two videos, the answer screen would also include a follow-up question or two. “What does the motor do on this object? How does using a motor in this object help people?” It was a fun review for the kids and an easy way for me to gauge whether or not the lessons we’d been working on were sticking or not. I’d love to hear how you are using Prezi with your younger students! Please share in the form of a comment or send me a quick tweet! Kick off a “belt” lesson with a 1-2-3 video connect! (Connect) Either review what has been learned or introduce what will be learned! It’s as easy as 1-2-3 and can be done in five minutes or less! Tip: I embed the videos in a Prezi so that they are located in one convenient spot and so I don’t have to worry about distracting comments under the videos that may be inappropriate for younger students. Sandwich bag saves the day. 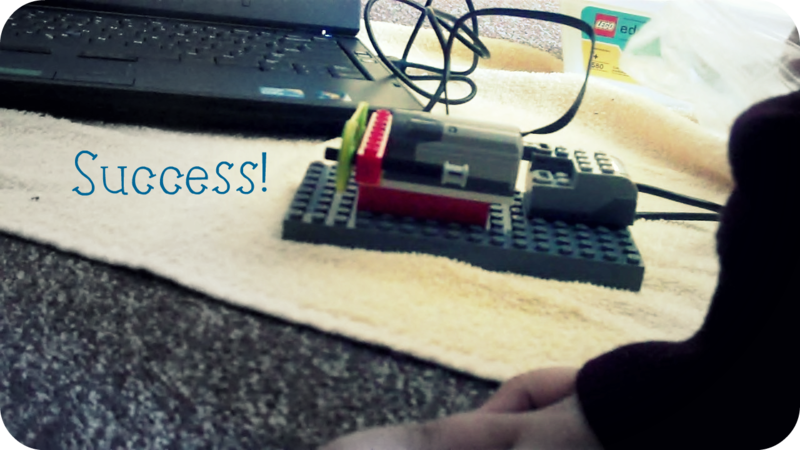 If you plan to launch a LEGO WeDo program with your little ones, here is a tip. Buy a box of sandwich bags. In the lesson, students construct a model using eleven pieces from their LEGO WeDo kits. The model has a motor turn a wheel that drives a belt that turns a second wheel. In my original lesson plan, students were instructed to open the tub, identify and remove the pieces they saw on the screen, close the tub, and build the model. I knew it would be important for the students to have only the necessary pieces in front of them and I thought having the kids separate them from the remaining pieces before building the model would be a good way of keeping the parts they needed separate from those they didn’t. After some effort, each pair of students found and took out most of the pieces they needed, closed their tubs and started to build their models just as I had instructed. Unfortunately, the minute they experienced frustration or doubt regarding the construction of their model, they assumed they had not “done it right” and opened their tubs to look for the “right pieces” or the “missing pieces”. This activity that I had intended to last no longer than 10 minutes was suddenly creeping up into the 20 minute zone and with the exception of one pair of students that had followed directions to a tee, every other pair had LEGO pieces all over their towels and were not at all close to completing their model. Yikes. It was definitely time to reflect. Was this lesson too difficult for our first graders? After class, I spoke with my co-teacher about what had happened during the lesson and asked how he suggested we revise the lesson. He suggested we guide the next group of students through the tutorial, step-by-step, identifying each piece and assembling the models together as a class. I respect my co-teacher and his ideas and this for me was not an acceptable solution. One of our main goals in implementing a robotics program at such a young age is to immediately immerse our students in an environment where they can solve problems by working together and develop an understanding that there are many ways to solve the same problem. Sure, if our goal is to have a room full of kids build a bunch of little models that work correctly, then a step-by-step lesson would work well. But making them follow step-by-step directions, would completely defeat the purpose of the program. I already know I can get a room full of seven-year-olds to do what I tell them. The question is can I not tell them what to do, and instead facilitate their learning process when they are given challenging tasks to accomplish as a team? I shared these concerns with my co-teacher and he was receptive and willing to continue exploring how we might improve the lesson a different way. We decided to review what did work in the lesson. The students clearly demonstrated that they could navigate the software, find tutorials, open materials windows, correctly identify and select most of the pieces on a materials list, and use an on-screen arrows to rotate model diagrams. We reviewed what was difficult for students during the lesson. There was no evidence that students knew where to start building the diagram or how to use different views of the diagram to get clues. They were also having trouble sharing the workload, managing the materials, and being confident that they had selected the correct pieces. When I sat down to revise the lesson I realized I was trying to do too much, too quickly with our first grade students. Originally, I thought it was important for the students to identify the pieces from the kit on their own. I believed it would be beneficial in helping them to develop stronger spatial skills. But I realized that identifying and selecting the pieces from a diagram should initially be an activity in itself. If what I want them to learn is how to quickly identify specific pieces from the larger pile, I can create an activity that focuses on identifying parts quickly, maybe some type of “LEGO Part Bingo”. Asking them to both select the pieces (which demands spatial skills) and also construct the model from a diagram (which demands spatial skills) was spatial skill overload. If Vygotsky were around he might suggest that the original lesson plan left the kids just outside of the Zone of Proximal Development for most of them. I decided to not worry about selecting the pieces for this lesson and instead placed the emphasis on 1. using a diagram to look for construction clues and 2. having a plan before being to build. Today, before the lesson I headed down to the lab and pulled the 11 pieces from each kit and placed them in a sandwich bag. Then I put the baggies of parts back in their kits. That little sandwich bag made all the difference. Today, doing the exact same lesson, in under 10 minutes, every student pair had successfully built the model with minimal support from an adult. So the sandwich bags not only saved us some time, but also helped me to remember that we can’t do it all the first time around. Great teaching takes practice and time.